Nicole graduated from the University of Kent in 2015 with an MSci in Forensic Science. Her masters project involved the development of photosensitive polymer thin films for use as light sensors. Nicole joined the Molecular Analytical Science CDT at the University of Warwick in 2015 where she undertook two projects for her masters year. The first project was investigating the physical ageing of poly(lactide) using solid state NMR, the second was modelling the segregation of pharmaceutical powders and blends. 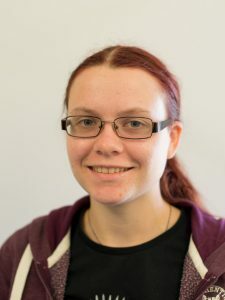 Nicole joined the Dove group and started her PhD in 2016 joint with the Hanna group, she is using solid state NMR to understand the physical ageing of Poly(lactide).